The importance of global cooperation on tax issues is becoming more and more evident. The sums lost amount to hundreds of billions annually. While steps to curb the losses are underway, gaps in global tax governance remain both in the institutional setting and with regard to substantive issues. For example, there is still no body with universal membership that could discuss issues that are of particular importance to countries in the Global South. In order to fill these gaps, either existing institutions need to be further developed, or new ones established, or both. In any case, a new body would have to perform certain functions and meet particular criteria with regard to composition. A new paper formulates options for achieving this. The importance of global cooperation on tax issues is becoming more and more evident. Countries in the global North and South alike have been shown to offer preferential treatment to foreigners: both individuals and huge transnational corporations are using a fragmented and inconsistently regulated global system of transborder taxation to evade and/or avoid taxes. The sums lost amount to hundreds of billions annually. Among the latest efforts to curb losses from an eroding tax base, tax avoidance and evasion are occurring under the roof of the OECD – most notably the BEPS (Base Erosion and Profit Shifting) process and the »inclusive framework« for its implementation – as well as reforms at the United Nations and the establishment of a Platform for Collaboration on Tax between the Bretton Woods Institutions, the OECD and the UN. 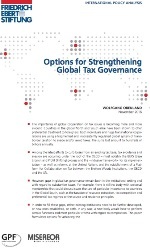 However, gaps in global tax governance remain both in the institutional setting and with regard to substantive issues. For example, there is still no body with universal membership that could discuss issues that are of particular importance to countries in the Global South, such as the taxation of resource extraction, tax competition and preferential tax regimes or the source and residence principles. In order to fill these gaps, either existing institutions need to be further developed, or new ones established, or both. In any case, a new body would have to perform certain functions and meet particular criteria with regard to composition. This paper formulates options for achieving this.